Well, he might as well have used the word "Geezers". In the social niceties moment at the time, perhaps he'd forgotten the word. 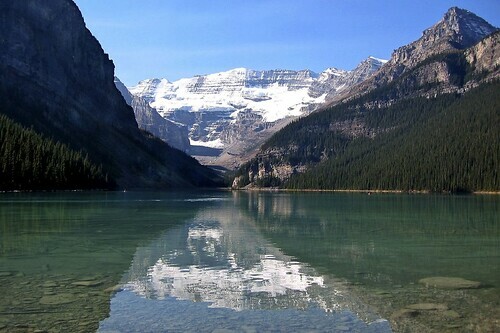 We, that group consisting of the Ever-Loving Wife, a truly fine Canadian couple we've been close friends with since the glaciers started pulling up their rocky skirts and retreated further north, and yours truly, were thoroughly enmeshed in enjoying ourselves on a patio with this view. We (same group as explained in that last paragraph of a sentence) had been accompanied by 3 of 4 of our children. Yes, lucky we (you get the picture!) four are to actually have kids who want to hang around on vacation with their parents. Although, vacationing in places like Banff, Lake Louise, and Flathead Lake, Montana would probably not be defined as difficult work for the young ones. The eight of us were hiking most every day, some were horseback riding, others were taking (excessive) amount of pictures, while still more were whetting whistles on appropriately mountain wildlife named beers. There was always activity; there was a semblance of youthful vigor exuded by our group. 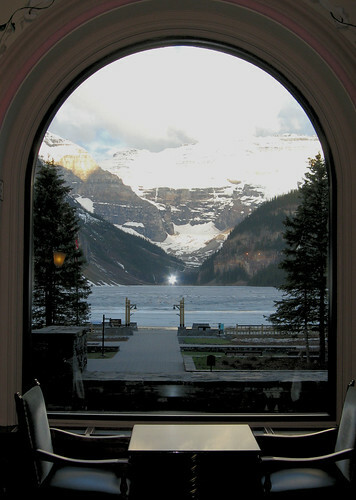 The We (yes, that foursome again) had parked ourselves with hot and cold beverages of equally soothing flow on a patio restaurant at Chateau Lake Louise, having finished another day of vibrancy (Yes, we vibrated all day. Up the trails, down the trails, across the trails. We were in full-fledged vibrancy. I have witnesses). We felt flushed with the stupidity of Youth. Nothing would burst our bubble. My son, a grad student in the geo-sciences area, knows of age. Biologists, archaelogists and zoologists have nothing on him when it comes to familiarity with old things. Only astronomists and cosmologists could trump him when it comes to describing obtusely long spaces of time. So, when he, along with the other kinder, approached the maître d’ and inquired as to our whereabouts by posing the request, "Please, take us to the four old people", his old implied age of epic duration. We (yes,unbeknownst to us, miraculously and cruely transformed to four fossils) were still drunk in the full effect of the Fountain. The maître d’ nodded at my son's request, took a measured turn and step, and, without hesitation in his gait, guided the kiddies through the sea of grey, blue, and silver directly to our table. The Table of Old People. Here, he provides an excellent monologue to deliver in the conference room when folks are stuck in that moment where almost everything necessary to discuss has been discussed and the Sargasso Sea rolls in immobilizing all. How to get out of the tangle of boring patter. Mr. Fez shows the way. Bathroom humour on a higher level.